I received the Toast catalogue in the mail yesterday and am just loving their unfussy looks. I like how age-agnostic their styles are. 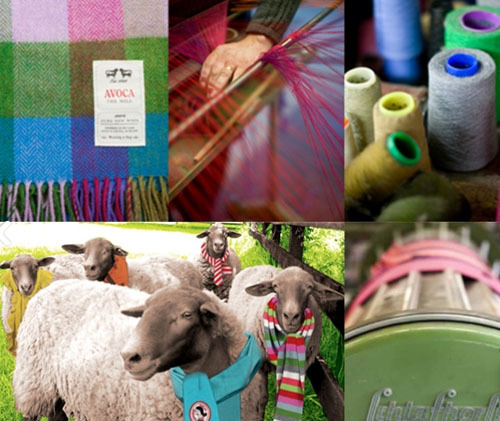 Avoca on Suffolk Street is one of my all-time favourite stores and a true mini-department store, with a food-hall and cafe in the basement, clothing, homewares and toys for three floors and then a divine restaurant on the top floor. If I could transplant any store from anywhere and put it in Toronto, it would be this one. When I was a grad student, I studied synaesthetic reactions to art and Richard Serra was one of my heroes. The idea that one sense can react when another is stimulated (that looking can make you feel like you're falling, or give you a sense of warmth or cold, of roughness or smoothness) rocks my world. Kandinsky was, of course, synaesthetic. As is David Hockney. But, like most psychological states, synaesthesia is not a have-or-have-not condition. It's something we can all tap into to varying degrees. 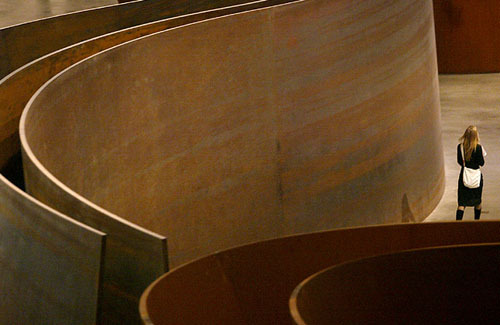 And artists like Serra can help even those who don't "get" synaesthesia to unwittingly experience it. Simon Baron Cohen and Richard Cytowic have some great papers on synaesthesia. My recent foray into wearing dresses has me smitten. This one from Karta at Shopbop is on my wishlist! I love the Hoss Intropia Fall Catalogue — the walls nearly as much as the clothes. I caught these shots of the Prada Resort collection on Style.com this morning. The model, the black, the drama yet complete prettiness of the clothes. I'm usually darn certain of my own personal style, but a look like this can send me in a tailspin wishing I dressed entirely differently. Yesterday morning I stepped outside and smelled autumn in the air. 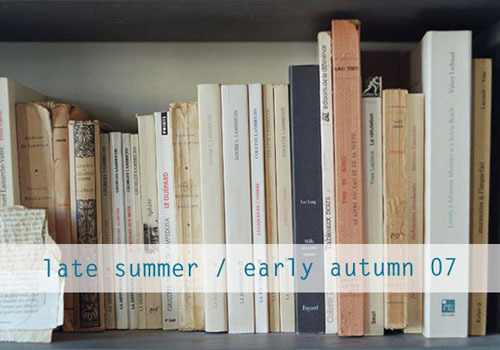 The last day of summer has not past - we'll flip-flop between seasons for a few months yet. But there is that moment, when for the first time in weeks you can actually visualize something other than 30 degree heat and humidity. It's almost like how memory is tied to smell and a waft of a certain scent can help you visualize a face you thought was gone forever. I think if we paid better attention to these strong sensory reactions, we'd be less mystified by the cycles of nature, the migration of birds and the seasonal changes. That slight change in the angle of the sun's rays is perceptible, we're just not paying due attention. 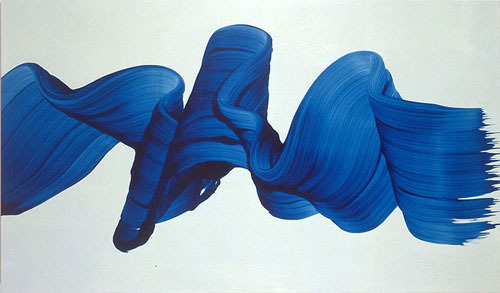 On the other end of the spectrum from my love of contemporary realism, is my love of abstract expressionism. 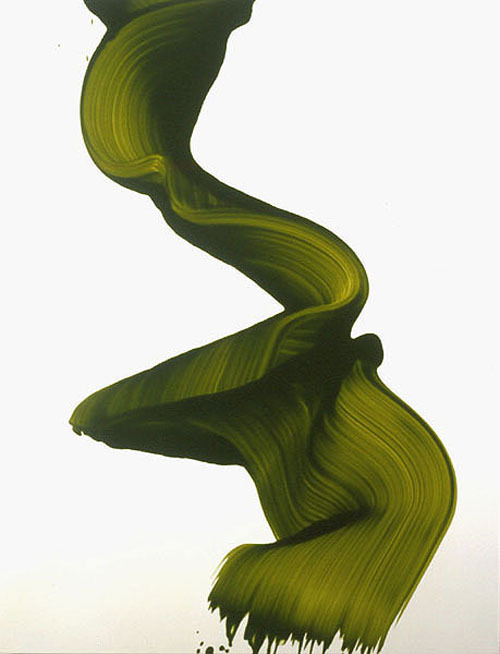 James Nares captures the decisive moment in one fell swoop (literally) with these beautiful ribbons of paint. I love how deceptively simple abstract expressionism can appear and how moving something that's not representational can be. I adore the herringbone pattern on this skirt from Tibi at Net-a-Porter. I love a big cleaning day: Taking all my books off the shelves and cleaning every surface properly I always arrange my books by colour - it's visually pleasing and I find it the easiest way to locate titles, which probably says something about how my brain is hard-wired. 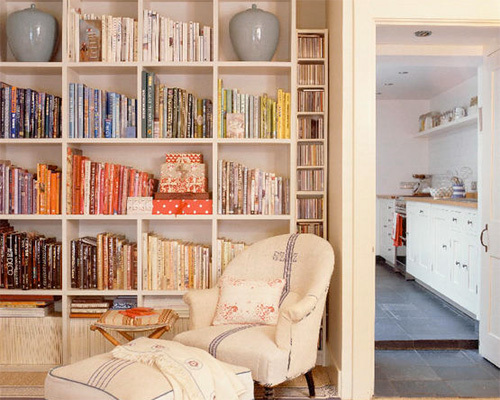 This image is from the fabulous galleries on the Homes & Gardens website. 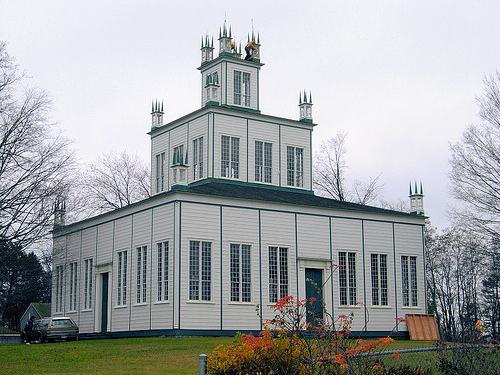 The Sharon Temple has got to be on my Top 10 list of buildings in Ontario. Maybe simply because I've never seen another building like it. Maybe because it reminds me (for both similarities and differences) of some of the churches you see in the Russian countryside. Image via Zelda Moon's Flickr. Another favourite, and this one I've seen in person, is Andrew Hemingway. You can catch these at the Godard Gallery. Clearly the mood is different than Stone Roberts. More serene, less of a dynamic narrative (Stone reminds me of Alex Colville for that foreboding narrative just beyond the horizon.) But still, there's something here that fires my imagination. 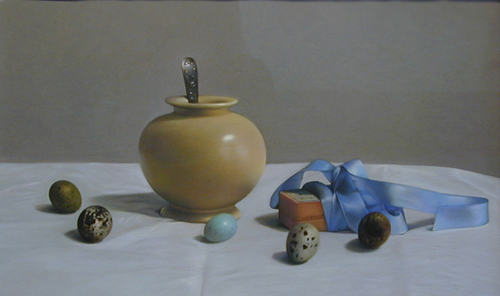 I adore contemporary realism, a painting style that's a nod to the old masters. With today's photography-accustomed eyes this style looks newly miraculous and scarily accurate. I also love the convoluted assemblages of items that go into those still lifes. Random pairings of convex mirrors, plants, flowers and vegetables, myriad textures (metal, wood, fabric) all designed to show the painter's prowess. There's something delightfully chest-pounding about it, while the result is truly beautiful. 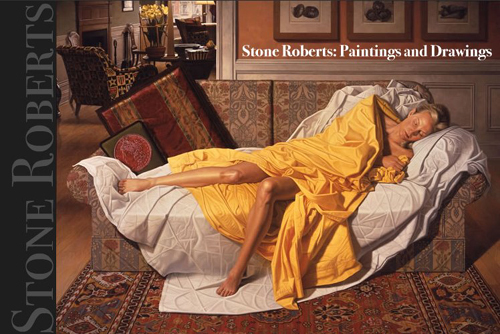 Stone Roberts is a must-look-at for this. Actually, I was loathe to put a picture here because I wanted people to see his actual site and zoom in on the details.